Oklahoma Health Initiatives, St. John Health System's accountable care organization (ACO), is collaborating with Aetna to redefine health care. Together, they have launched Aetna Whole HealthSM – St. John Oklahoma Health Initiatives health insurance plans. These patient-centered plans enable providers to track outcomes through shared data, measure clinical standards to improve quality and efficiency, and deliver highly coordinated care. Aetna Whole Health – St. John Oklahoma Health Initiatives plans include a strong provider network that extends beyond St. John. Together, this health care community has the tools to keep patients engaged in and educated about their health, and studies show engaged patients are healthier patients. Aetna assists providers in this mission by identifying potential gaps in care and transforming patient data into actionable information. The focus on proactive care management also helps patients with chronic conditions better manage their health and, thus, their health care costs. In this network, doctors are paid for keeping patients healthy and improving outcomes, not just for treating them when they are sick. Doctors combine preventive measures with technology and the latest clinical guidelines to help ensure the most effective, up-to-date health care. For more information about being an Aetna Whole Health member, visit www.myaetnawholehealth.com. Spiraling health care costs are a serious problem for employees and employers alike. That's why Oklahoma Health Initiatives is collaborating with Aetna with one goal in mind: to deliver better patient care at a lower cost. 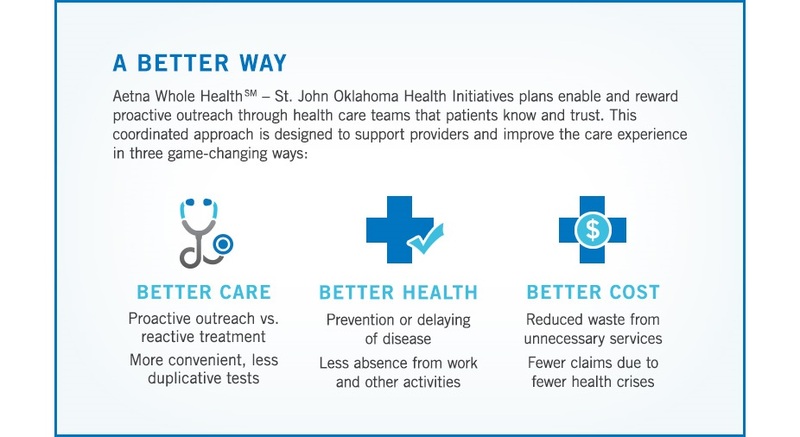 Aetna Whole Health – St. John Oklahoma Health Initiatives plans target 8-15 percent savings compared with broad-network Aetna plans. Designed for and driven by doctors, this unique plan can give employees better results without added costs. Empowering employees to be more engaged in their own health care is not just good for their minds and bodies — it's good for business. Studies show employees in good health are more productive than their less healthy colleagues; they take fewer sick days and make fewer errors while performing their jobs. Aetna Whole Health – St. John Oklahoma Health Initiatives plans are available to self-insured and fully insured businesses. For more information, contact your local broker, call Aetna at 1-855-282-3867, or visit http://advisor.aetna.com.